Preview: After a run of four straight wins, Gujarat Fortunegiants will face the daunting Dabang Delhi in the teams’ second encounter this campaign at the Shaheed Vijay Singh Pathik Sports Complex in Greater Noida. Gujarat Fortunegiants had managed to get the better of Dabang Delhi in every one of their encounter in Season 5. But Season 6 saw Dabang Delhi rally hard to return a tie. They will now want to use this momentum to push for their first win against the side when the two teams clash on Sunday. The first match between these two sides this season ended in a 32-32 tie after an exciting back-and-forth contest. 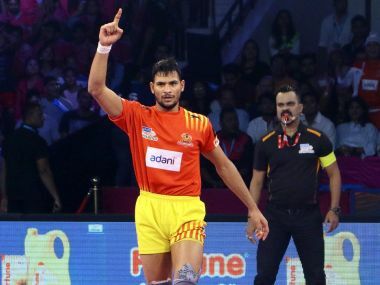 Dabang Delhi.’s Chandran Ranjit had an outstanding night, scoring 10 points whereas their Corner duo of captain Joginder Singh Narwal and Ravinder Pahal combined to score seven points. 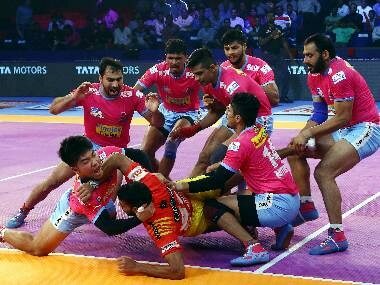 They were equally matched by the Gujarat Fortunegiants’ captain Sunil Kumar and corner Ruturaj Koravi as they managed four tackle points each on the night. While Dabang Delhi led the raid points tally in that match, Gujarat Fortunegiants managed to outdo them in terms of tackle points. 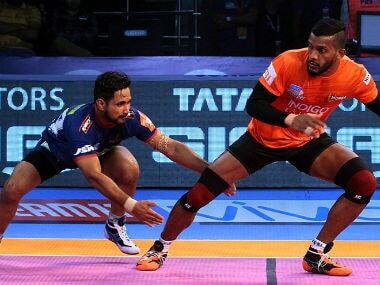 Head-to-head: Dabang Delhi 0 – 3 Gujarat Fortunegiants. 1 Tie. Dabang Delhi are on a run of two straight losses and will aim to cease it when they battle Gujarat Fortunegiants. They will draw confidence from the fact they are one of only two teams to avoid defeat as well as score over 30 points against Gujarat Fortunegiants in the season so far. Dabang Delhi have conceded an average of 33.67 points this campaign while Gujarat Fortunegiants have leaked more than 30 points just twice. Dabang Delhi will have to tighten their defence in the game against Gujarat Fortunegiants if they are to push for a win. Gujarat Fortunegiants have been in stunning form this season, managing four wins on the trot with their last three seeing them have a combined points advantage of 32 over their three opponents. 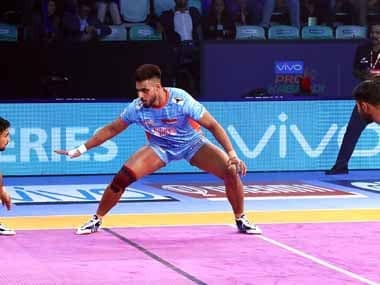 In their previous match against the Jaipur Pink Panthers, captain Sunil Kumar managed an astonishing eight tackle points and was well supported in defence by corner Ruturaj Koravi. While Gujarat Fortunegiants’ defence has been dominant so far in this campaign, Dabang Delhi can claim to boast of a strong defence themselves. They are led by their Left Corner Ravinder Pahal. Pahal has managed a team-leading 18 tackle points and has been prompt and decisive in his tackling this campaign. With 49 raid points in six appearances so far, raider Sachin has been outstanding in his second year with Gujarat Fortunegiants. He also leads his team in the Do-Or-Die raid points category.